September is here and thoughts turn to back-to-school, fall festivals, harvest, and football. It is also apple-picking time. Ah, apples! Healthy, crispy, symbolic and colorful. They are good for you physically and spiritually. John Chapman, known as "Johnny Appleseed" (1774-1845) was an American nurseryman who introduced apple trees to large parts of Ohio, Indiana, and Illinois. When I was a child, at summer camp in the mountains of Virginia, we sang the Johnny Appleseed song around the campfire and before each meal, "The Lord is good to me, and so I thank the Lord, for giving me the things I need, the sun, and the rain, and the appleseed. The Lord is good to me." Step 1: Grab a pencil. Draw the outside shape of your apple. Begin with a circle if you want and "adjust" it. Nature does not have perfect geometric shapes, so irregular, uneven, or lopsided circles are perfect! In art terms (see how I am cleverly sneaking art vocabulary in on you?) this is called “organic” shape and is one of the Elements of Art (shape). Step 2: Add in a detail or two, like where the stem is attached, and dimples. Step 3: This is where your apple comes to life. I want you to try shading (called value, another Element of Art). Shading means looking for darks and lights. Using your pencil, begin on an outside edge and color in dark. Take pressure off your pencil point and work inwards lighter. 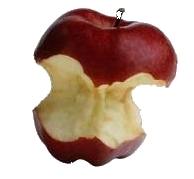 Use the curve shape of the apple rather than straight up and down or sideways lines. Step 4: Next, try your hand at some textures (ah, another one of those Elements of Art). 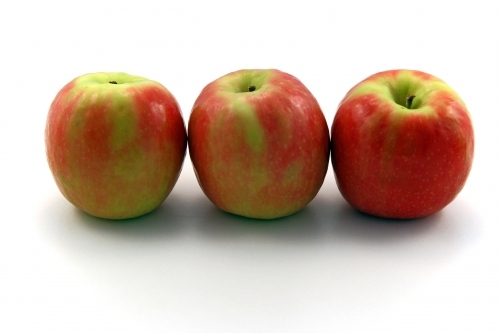 Does your apple have freckles, spots, lines, or splotches? Speckle those in. Step 5: Work in some color. (Goodness, just how many of these Element things are there!?) Here is where I will reveal an “art trick” to you. NOTHING is just one color! Nothing. Really observe your apple and see just how many colors and shades of colors it has. Step 6: Enjoy your apple and your drawing. Start doodling apples everywhere! A creative act a day is good for the soul and spirit. Now, are you remembering my number one rule for creating? NO JUDGMENT!